on the water can be refreshing and invigorating! Come join the paddle sports of choice for thousands of people. 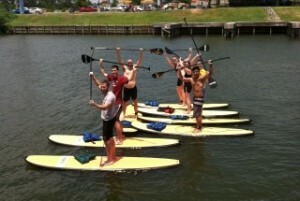 Yes, paddle sports have adopted the newest contender with paddle boarding. They are great fun and exercise all at one time. Get a work out while paddling around your favorite waterway and enjoying the natural beauty. Paddle boards are fun for the whole family as the kids can ride up front while the parents paddle in the back. Or, if the kids are big enough get them to paddle you around. Paddle boarding is something that has become quite popular in recent years and we know why. It’s a great way to get out and enjoy the beautiful weather and get some exercise at the same time. Paddle boards come in all shapes, sizes, weights and such so be sure to do your research on which board would be right for you. There is equipment needed for Paddle boarding The most important piece is the board itself. This component comes in all shapes, designs material and sizes. 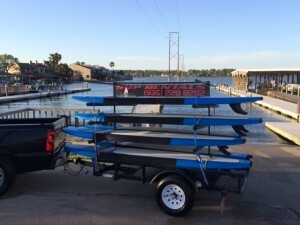 Boards can be made of fiberglass or epoxy and are 12-19 feet in length. On some of the models, a traction pad is placed on the top to allow the user some added traction. Although, this is a nice feature it’s not something that is necessarily needed to enjoy your board. Most have a rough like surface that will allow you to get the traction you need. The popular new trend in water sports has advanced over the years. The epoxy boards are much lighter option and easier to handle when out of the water. A paddle that is extended to allow you to stand up on the board. To do this sport you stand up on the board facing forward with your paddle in your hand. Gently bend your elbow to get the force behind the paddle. Be sure to look forward and not down at your feet or the water as this will cause you to rock. The paddle must be a good length for you. These are usually fairly inexpensive and there are all sorts of choices, but the main thing is the length and many of them come with an adjustable length which is perfect so you can share your board with others if they would like to give it a try. Paddle boarding isn’t horrible to learn either. Most anyone can do it with a few tries. Just like riding a bike or anything else that requires balance, it may take some longer to get the hang of it. But, it calm water and the right mind it really isn’t that complicated. And, the best thing about it is you are getting an amazing core work out without even realizing it and getting to check out the local waterways. Stand up paddle boarding is a new way to experience the wildlife in the water around you. As you glide gracefully, after a few trials and errors, you can be one with nature. There are no running boat motors or noise of any kind. Some find this to be super relaxing almost like meditation. You can go in a group of people or alone. Paddle boarding has so many options and variations that is why it’s become so popular these days. Paddle boards can be used by people of all ages and is great exercise. The diversity of the sport ranges as well, from those that want to glide across the water to white water paddle boarding and all water and experience levels in between. SUP (Stand Up Paddle boards) is a popular sport and we think we know why. It has a very low barrier to entry, doesn’t need any large amount of skill and it’s relaxing and exercise in one. This is something that you don’t commonly find. Paddleboards for fishing can be a useful tool as well. Included in paddle sports is fishing. While you can fish from a kayak, you can also fish from a paddleboard. You quietly glide into your favorite fishing spot and often you will find fish that will swim along with you while gliding. Taking the board to places that you might not be able to reach with a motor too. Grab a backpack that has a good side pocket for holding your pole as you paddle your way out. Paddle out to where there are dark spots in the lake, these are usually deep holes and fish seem to love them. Since you are standing on the water you can see across it better than in a boat to sense the depth. Be sure to do this in a safe manner. As fish do like to hide out in the weeds, but if you are not an experienced paddle boarder this may not be the best option for you. Finding some drop offs and hole might be better as if you do get a fish on, it can get a bit tricky for the first few times, but after that like anything it does get easier. And, if get a nice one on, they can pull you around a bit on the board to wear them out. Great clean fun times for your or a group. Sup boards are taking over the waterways and well, you can see for good reason. They are good clean fun sport that all ages can enjoy with a friend or alone. Another wonderful sport that is both relaxing and full of exercise. Who could beat it? If you love water, the outdoors and sunshine, then paddle boarding is right up your alley. Kayaks are a good time as well. You can paddle them around without the noise of the motor and take in all the views around you. Go alone or with friends. Grab a camping tent and bring it along and stay along the river. Kayaks are a little more versatile than Sup Boards for longer trips. As you aren’t standing up the whole time and you can carry more camping gear with you. 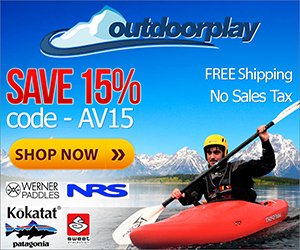 For information on Paddle Sports education, safety, activities, and groups, visit Paddlesports North America.